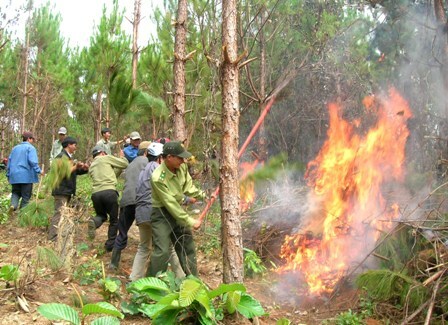 TAY NINH (VNS)— Localities throughout the nation are taking action to prevent forest fires due to this year's prolonged dry season. For instance, the southern province of Tay Ninh has taken drastic measures such as building fire belts and intensifying around-the-clock patrols to protect 60,000 ha of forests at risk of large-scale fires. These forests are located along the border with Cambodia and the southern province of Binh Phuoc. Earlier on March 7, a forest fire was reported at a 0.6 ha area in the forest of Ba Den Mountain. Negligent burning by local residents was believed to be the cause of the fire, according to the provincial Department of Forest Management. In the Tram Chim National Park in Cuu Long (Mekong) Delta Dong Thap Province, Director Nguyen Van Hung said guards armed with fire fighting equipment were assigned around the clock to protect the park from forest fires. The park's management board had also worked with local authorities to increase the distribution of information to raise fire awareness among local residents. The park covers more than 7,300ha and includes cajeput forests, with most of the trees being 10 to 20 years old. Other localities nationwide that have been alerted to forest fire risks include Binh Phuoc, Dong Nai, Gia Lai, Khanh Hoa, Kon Tum, Lam Dong and Son La. In 2013, nearly 250 fires occurred throughout the country, destroying 965 ha of forests, though no casualties were reported. The same year, more than 227,000 ha of land nationwide were covered with trees, according to the Ministry of Agriculture and Rural Development.